Zyuohger Episode 22: Did Toei Let Michael Bay Direct This Episode?! This week's Zyuohger gave me the feeling Michael Bay directed this episode. While that's just a joke due to what happened, it's because of how the episode went that's why I want to joke Bay himself directed this episode. Misao is still trying to make up for what happened to him while he was under Genis' control. I could talk about some things that I expected and what I didn't expect. While Misao goes jogging, he touches a bike and it explodes after he feels some weird tingling. I thought he secretly had that power until it's revealed that Deathgalien team player Illusion is behind it. What makes me go WTF is to think is that there have been a lot of bombings here and there lately. Illusion turns every object into a bomb which makes Misao believe he's cursed. That's until the more predicable part where it was a Deathgalien plot to blow up Tokyo. 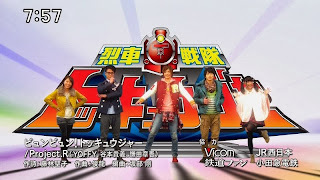 For some time now, Super Sentai's had the dancing cast during the end credits. Zyuohger is still doing it. But it's not entirely new either. Instead, it creates various gimmicks where some succeed and the others fail in a process of trial and error. 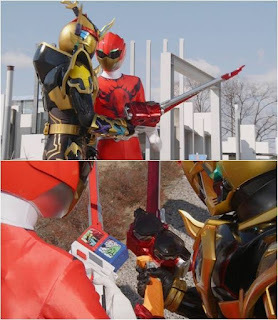 It can take a kick back all the way back to when Super Sentai was at its "struggle stage" up to present to understand what went on, why it didn't immediately work and why it works now. Are Darker And Edgier Super Sentai Seasons No Longer Feasible? As trends change every now and then, Super Sentai ends up getting its development team to innovate for the children's market. While I could enjoy some lighter and softer Super Sentai like Zyuohger is pretty entertaining for me, I tend to prefer darker and edgier. Ironically, I didn't take much of a liking to Go-Busters compared to Zyuohger. Most of my favorite series (based on my own personal preferences anyway) are on the darker and edgier. But is darker and edgier still feasible? Let's try to take a review of the trends that happened. Remember that I'm just sharing my opinion on series I've seen from start to end and some very limited knowledge. Warning! Spoilers ahead! Read at your own risk! So Zyuohger had one delay last month and another this month. I was getting pessimistic because at least two delays were happening. I don't feel very happy about how Kamen Rider Ghost is and I'd be looking forward to the Zyuohger movie instead of the former's movie. But I'd still watch Kamen Rider Ghost's movie even if I'm not liking this year's Kamen Rider as much. It's time for this week's Super Sentai and I'm happy to announce I've been feeling positive about Zyuohger. While doing some rewatching of pre-Decade Heisei era Kamen Riders, I noticed that there was a time when there's been some differences in tone between Super Sentai and Kamen Rider. Back then, Super Sentai was usually darker, edgier, more intense in the action scenes department and "more mature" though it was also rivaled by Metal Hero. Eventually, Metal Hero jumped into the lighter and softer with B-Fighter Kabuto, Robotack and Kabutack leading to its eventual cancellation of the franchise. Super Sentai started to get less serious (again) with Carranger since some pre-Zyuranger era series like Dynaman and Goggle V were on the lighter side but more action anyway. 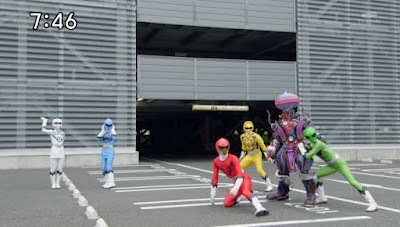 Why I Think ToQGer's Imagination Theme Was A Great Idea But It Wasn't Carried Out Properly! I don't have anything against lighter and softer Super Sentai as long as it's done well. Some of my favorite Super Sentai and Kamen Rider shows happen to exist in the world of teddy bears and rainbows like Kamen Rider Kiva. Ressha Sentai ToQGer also takes place in such a light environment. The show itself could have actually tried to become an official version of Akibaranger running for an entire season instead of a two season mini-series. 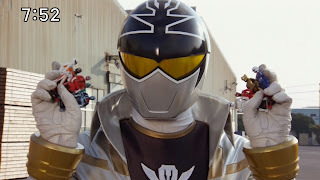 Eight Super Sentai Seasons I Felt Were "Hybrids" Of Two Or More Previous Super Sentai Seasons! Super Sentai's innovation may involve introducing an entirely new motif. Let's think about how Super Sentai had that. Goranger and JAKQ were two different motifs. 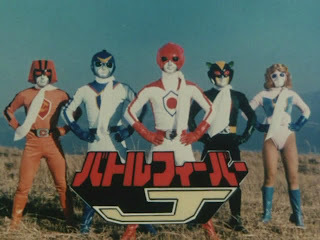 Battle Fever J was trying to do Avengers x Super Sentai. Military-based Super Sentai like Goranger, Sun Vulcan, Changeman, Jetman and Ohranger have different motifs in spite of being united under the military theme. Then you have some first time motifs like Changeman had the space theme followed up by next year's Flashman (and the same pattern happened with Power Rangers in Space and Power Rangers Lost Galaxy), Turboranger with cars (and in extension teenagers with attitude). Fiveman introduced a sibling themed Super Sentai followed by GoGoFive and Magiranger yet they all had different motifs. 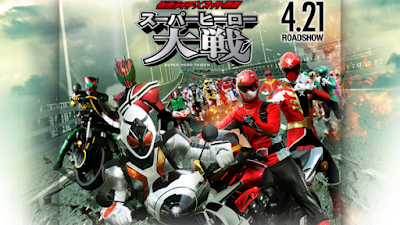 This is another huge compilation of 40 seasons of Super Sentai. Zyuohger had a series of animal motifs involved. Since it's an anniversary season, there's always the tendency to, "Hey let's fly all the way back to 2006 to 1996 to 1986 to 1976." depending on the producers if they felt like there was a whole load of ideas that they felt needed to be modernized. Now it's time to focus on the rangers themselves. While I'm enjoying Zyuohger, I really said this, "For the 40 seasons of Super Sentai, I would dare believe that every time innovation happens that the main focus is on how to sell more toys." Super Sentai is more of a children's show. Adults belong to the secondary market while children are the primary market. Older audiences may still enjoy it with their children or nephews or for some, with their grandchildren. Let's take a look at a lot of gimmicks that have been created for a very long time. Analyzing the gimmicks Toei made throughout the years for Super Sentai may help provide an insight to what went on with Toei's research and development for selling toys. I even felt that happened during Zyuohger's and Kamen Rider Ghost's meeting in each other's shows. Zyuoh Eagle and Kamen Rider Ghost looking at each other's weapons made me want to think it's a message that says, "Don't forget to buy our toys!" 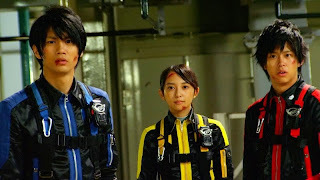 After I wrote a post discussing that Super Sentai doesn't get better or worse every year, I felt like writing this post to discuss what may cause Super Sentai to get better or worse per year. 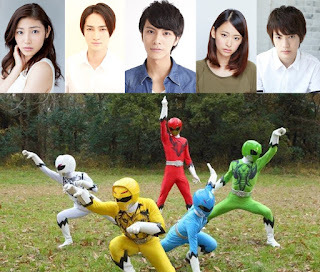 Here are the seven factors that I believe that may affect Super Sentai's performance and how critics may respond. These can affect any Tokusatsu show as well. There may be more factors but here's seven possible factors that I'd want to point out that may affect performance and reception. After seeing this week's Zyuohger, I wanted to write on this short entry. Misao Mondo has now officially joined the team but I can't blame him for his total wreck. I mean, he did something horrible (in a way). If you remembered in this week's episode, Misao admitted that he accepted the offer by Deathgalien because he was a loner. In a way, it's a Faustian pact with them. Although he DID NOT take the life of the three Zyumen (names unknown) but it can't be denied that off-screen, Genis shows some off-screen cruelty and who knows what's next. The temporary and short-term nightmare fuel with the scene where he's being converted into a Zyuman was something. It may be a good idea to take a look at the 40 years of Super Sentai with how they did with action scenes. While Zyuohger like a huge chunk of Super Sentai from Carranger up to present have action scenes but they aren't like the ones I love from old school Super Sentai. I want to make this speculation to what led to a reduction of the quality of action scenes. 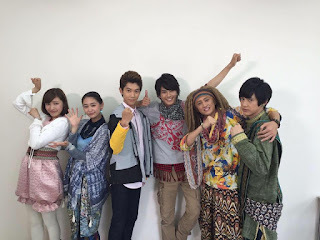 I have to remember I'm not watching Wuxia films and series but Super Sentai while I'm writing this post. As part of giving tribute to 40 seasons of Super Sentai, it's time to also acknowledge the writers and producers who I believe revolutionized Super Sentai. Not that they didn't have errors. Besides, their later works also showed they had signs of burning out but let's not forget their important contributions as well. 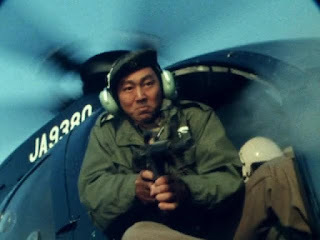 It would be plain rude and crude for me not to honor him considering that he's the producer of the very series that first started Super Sentai. That series was none other than Goranger which aired for 84 episodes. I'm still skeptical about watching it because I'm too used to watching Super Sentai airing for usually around just one year. But here he is, the producer that started the trend. 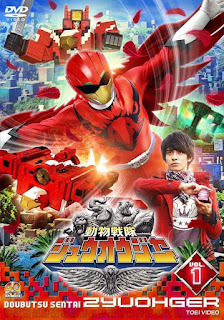 Is Yamato Kazakiri/Zyuoh Eagle Also A Throwback To Gatchaman's Ken The Eagle? While watching Zyuohger, I noticed something that the motif behind Yamato Kazakiri is the third eagle swordsman. Every time there's a bird related ranger in motif there seems to be a Jetman throwback. Gaku Washio/Gao Yellow had retractable wings and a two edged sword to fight foes. Then I think of the fact that some of Jetman's characters are inspired by Gatchaman's characters. Even if the show was so 70s, the concept still gets carried on with newer ideas to mix with the old. The Problem Of Having The Gokaiger Hype! It's five years after Gokaiger and I'm probably enjoying Zyuohger more than Gokaiger. Now I'd like to readdress the Gokaiger Hype. I have the feeling that Gokaiger ends up as another overrated Super Sentai season even after five years. 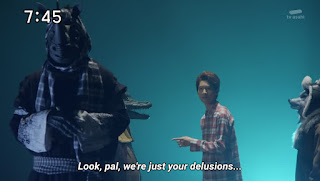 I'm afraid that some people are probably too stuck with the Gokaiger hype, they think it's the best Super Sentai season ever and the reasons aren't even valid. It's okay to really love Gokaiger but the problem is when you're stuck with the Gokaiger hype. What do I mean by the Gokaiger hype? 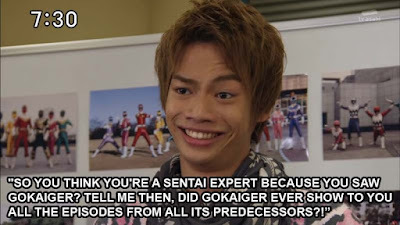 I would classify it as the attitude that you still think it's the best and that it may also include the attitude you think you know everything about Super Sentai just because you saw it from start to end.